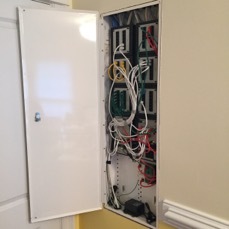 Custom install featuring Leviton, On-Q, and Russound components. 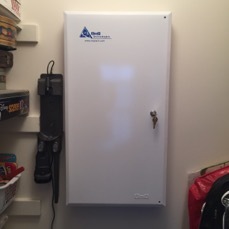 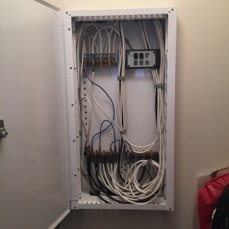 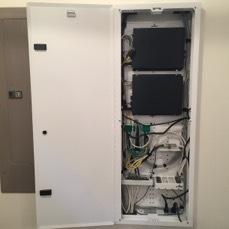 A Leviton panel with telephone, Internet, and satellite TV service, as well as two Russound amplifiers (for whole house audio) were installed at the demarcation box. 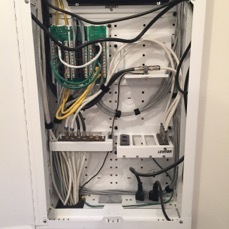 Separate OnQ boxes for Coax and Cat-5/6 cabling were centrally located on the main floor to allow for shorter runs. 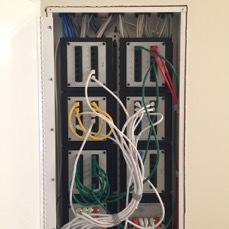 A Russound MCA-C5 and a DMS3.1 provide whole-house audio capabilities. 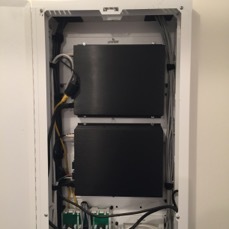 Two outdoor rock speakers requiring long runs of underground cable made the use of separate amplifiers a necessity. 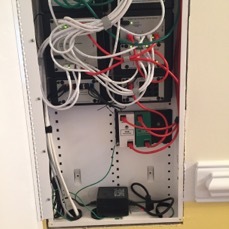 The line level audio signal is transmitted from the MCA-C5 to the Leviton panel using two pairs of Cat-5/6 baluns. 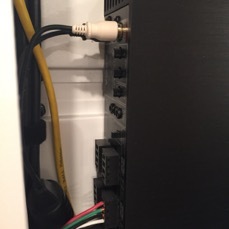 Normally we would not put amplifiers in a panel, but we added the extender which has slots for heat dissipation.